If you’re anticipating next year’s hottest kitchen trends, we’re right there with you. So what might the quintessential 2016 kitchen look like? We asked two interior designers for a sneak peek at what’s to come. 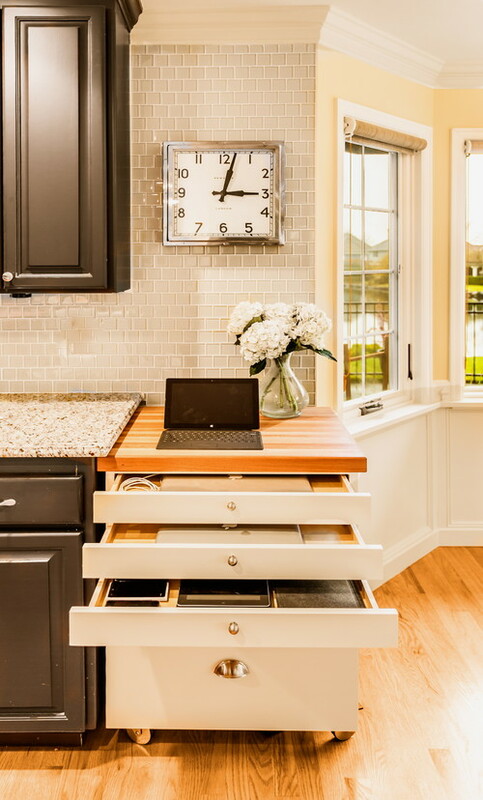 Hi-tech workstations, ’80s glam and muted color schemes are just a few of the looks they say will lead the pack. Without further ado, here are nine trends they predict will define kitchen design in the new year. 1. Soft, muted color palettes. Good news if you’re already thinking about switching up your color scheme: Kitchen colors are changing, according to interior designer Jane Lockhart. 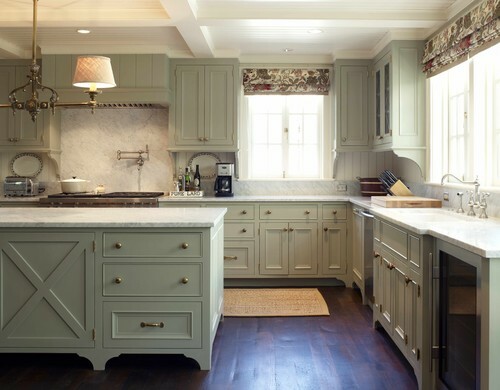 Though white motifs will still dominate, everything from cabinets to backsplashes will be done in less saturated tones. “Charcoal, grays and even neutral pastels like pale blue, pale green gray and tinted whites are the new alternative to the standard white,” she says. She also foresees kitchens sporting lighter wood tones, including walnuts, whitewashed woods and white oak in rift grain. 2. Smart spaces. Get ready for a hi-tech makeover. Both Lockhart and Drury predict more kitchens will have designated spots for smart devices next year. “Look for areas with hidden charging stations to store devices like phones and tablets so that they are always operable, at hand and charged,” Lockhart says. 3. An ’80s reboot. “The ’80s are back,” Lockhart says. Mirrored backsplashes, brass accessories and high-gloss surfaces aren’t dead by a long shot, but they’re more elegant and refined this time around. “An elegance not seen in the ’80s will be an incorporation of a variety of natural materials to remove the ‘plastic’ look of that great hair decade,” Lockhart says. Drury adds that homeowners will opt for brass with satin rather than shiny finishes. 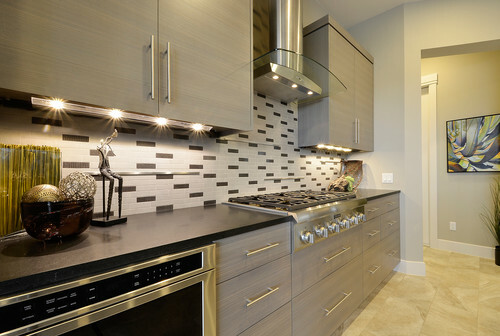 In 2016, metal will assume a more dominant role in kitchen aesthetics and trump wood as the range hood of choice. “Wood mantle hoods are being replaced with metal hoods or ones that are a combination of wood and metal,” Drury says. If you’re planning to follow suit with next year’s fixation on neutral color tones, a metal hood can introduce a burst of contrast into your kitchen. 5. Integrated kitchen-living spaces. Maybe your kitchen feels disconnected from the rest of your home. Maybe you want your cooking space to feel more accommodating. Either way, this trend could be for you. 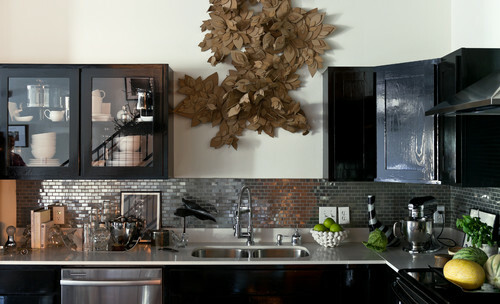 Lockhart anticipates more streamlined kitchen designs in which the kitchen converges with the home’s primary living space. “It will become part of the main living space even further,” she says. 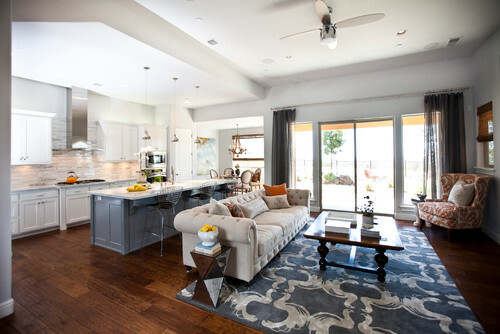 Designers will merge kitchens and living rooms by including hidden and integrated appliances. 6. A new kind of tradition. While it’s no surprise that present-day kitchens are embracing simple design, Lockhart expects traditional spaces to hop on board too. “Even traditional kitchens may experience a slightly cleaner feel with bold lines and less fussy details,” she says. But Lockhart says it isn’t the end of traditional design as we know it. It just means homeowners will opt for fewer frills and more calculated, strategically placed details. 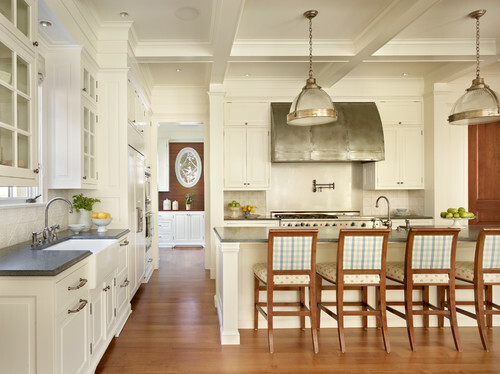 “Traditional designs will always remain popular, but future renditions will be more deliberate with an emphasis on key elements like hoods, islands, cabinet crowns and so on,” she says. 7. Texture-on-texture contrast. It’s time to reimagine contrast in 2016. Drury says variations in texture will rule, rather than traditional methods of contrast. “Strong contrasting designs are being replaced with more texture-on-texture designs,” she says. 8. A nod to midcentury mod. Lockhart credits this trend to the popularity of midcentury modern furniture and says the period design will trickle down to kitchens. “To some extent, this is already occurring with the increasing use of walnut in islands and cabinet doors,” she says. 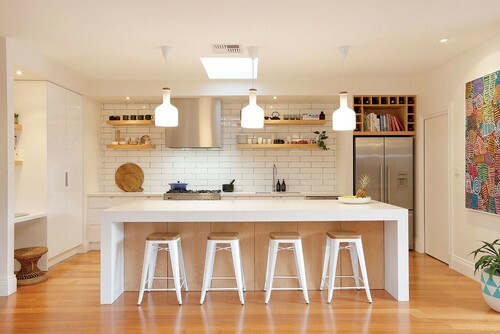 “But look for more kitchen styles that offer a nod to ’60s modern style, also called Nordic style.” You can get in on this minimalist movement by choosing predominantly white color palettes, designing with light wood textures and clearing away unnecessary clutter. Nordic design is all about simplicity and functionality. 9. Well-lit cabinetry. Homeowners won’t settle for just ceiling lights and table lamps to illuminate their kitchens. The two designers say extensive cabinet lighting is a trend to watch. “Low-voltage light tape strips are used as accent pieces below cabinets, above cabinets, inside cabinets and below countertop overhangs,” Drury says. “LED lights are the norm.” These features will be grouped with recessed can lights to offer better mood-setting capabilities.